If you're happy and you know it–eat some chips. If you're happy and you know it–have a soda. 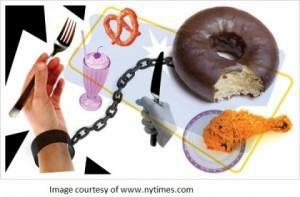 If you're happy and you know it–and you really want to show it–if you're happy and you know it … stop binge eating! America is a country of binge eaters. Feeling great? Grab a bag of potato chips. Had a bad day? Drown your sorrows in a 2-liter of high-calorie sugar. Bored, lonely or tired? That calls for candy. That's the way it is in America; everyone seems to eat when they're feeling emotional. It makes everyone feel better–at least for a while. But it also contributes to excessive weight gain, medical problems and ruined diets. The first step in fixing any problem is understanding what's causing the problem. Identifying the reasons you binge eat–a bad day, a good day, boredom, a great night of television–is the first step toward finding a way to avoid binge eating. Acknowledging that you're having trouble controlling your emotions can actually give you more control over your emotions. Owning your triggers–taking responsibility for them–makes them seem less insurmountable and easier to overcome. Now that you know what your triggers are and you accept them for what they are, you can start making smart decisions about how you deal with them. For example, if you know that you binge eat during the evening news every day–because that's the only time during the day that's "your time," you can put an intentional plan in place to help you do something other than eat–as long as you think about it. So you've decided not to eat potato chips when you're watching the news? Great, just don't consider it a diet. Diets are all about depriving yourself of things you want. Instead, consider yourself working to change your lifestyle. Your decision to own your triggers and think about not letting them control you is about more than diet. It's about lifestyle.